It was awesome to watch how Dr. House and Nurse Jackie would treat their patients even under an influence of a drug. The glamorous TV shows have masked the dark side of reality. According to research, drug and alcohol addiction of doctors and nurses stands at between 10 to 14 per cent. Ashley Taylor, a 33-year old nurse, working at Spring Hill Care and Rehabilitation Center has been charged of stealing drugs from the rehabilitation center. On Tuesday, administrators of the Spring Hill Rehabilitation reported theft of medication from their facility. According to the Sheriff’s office, Taylor faces 12 counts of possession of controlled substance.Taylor told the deputies that she ordered extra medication from the pharmacy so patients would not miss their dosages.These drugs included Percocet, morphine, codeine and alprazolam, which is commonly known as Xanax. 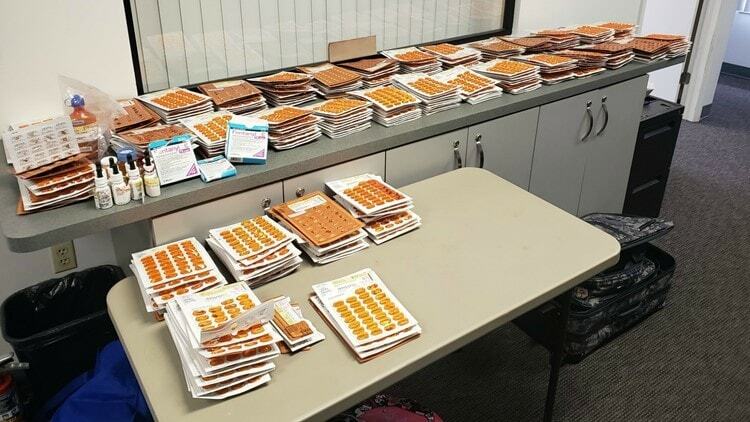 Detectives investigated Taylor’s house and found more than 300 empty blister packs which was more than 10,000 tablets of medication. 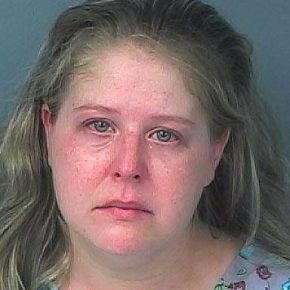 Taylor told the deputies that she committed fraud by ordering extra medication and telling them it was for parents. After going home, she would set it aside or her daily consumption due to her drug addiction which she claimed to have started from an injury. According to her husband, Zach, he had already suspected that Ashley had a problem after a surgery about four years ago. He even tried drug testing her. “I did urine tests on her and she must have gotten clean urine from somewhere, because she passed the test that I gave her.” Zach said. He also started noticing behavioral change on Ashley. When deputies arrived and notified him of the arrest, Zach isn’t surprised at all. 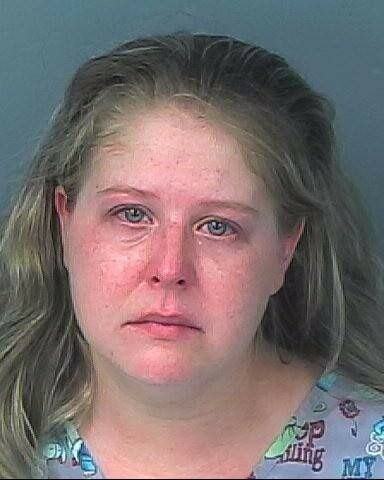 She is now being held at the Hernando County Detention Center with a $31,000 bond. Another case of a nurse stealing drugs involved a Meridian nurse was charged with 32 counts of obtaining controlling substances by identity theft and fraud, last June 14. Jennifer Fanopoulos, a 40 year old nurse who worked at a Boise hospital used the patient’s information in order to obtain prescription drugs for illegal trafficking. She stole the financial information from four patients in order to manipulate the hospital’s system that regulates the medical dispensation. She initially stole one or two vials of fentanyl, and stole large doses as time went on. It was reported that Fanopoulos stole about 68 vials of fentanyl in less than 2 months. Why can’t they say no to drugs? Nurses have a truckload of information on all kinds of drugs more than a normal individual does. One professional drug addict told himself for a long time, “I’m not an addict because I know everything there is to know about this drug, and I still take showers and go to work.” This is how he pacified himself whenever he is bugged by his conscience. No patient would double check whether their dosages are of the right amount whenever given to them. Of course, they would trust the healthcare professionals with their medications and assume that the correct amount is given to them and that they are well taken care of by a sober professional. After all, that is what their money pays for, right? Whenever patient would run down low of medication, they could just press the button and ask. Although it would take some time for a nurse to justify another dose to be given, but when they get past the scrutinizing questions about these, they are good to go and another cycle of short-changing the medicines of the patient begins. Each state has its own Board of Nursing which offers a program for addicted nurses, however, the programs that they have are only there to help whenever one reaches rock bottom or when they happen to hurt a patient. The State does not differentiate people who come forward with people who get busted or kills a patient. In simpler terms, seeking help would mean a career suicide. There are no incentives to gain coming out of the closet other than making friends with your conscience. How can hospitals detect RNs addicted to drugs? There are no distinct signs and symptoms to tell whether the nurse is addicted or not. However, there may be some key markers one must be aware of and raise red flags on such nurses. Suspecting an addicted co-worker? Here are tips on what to do. No one shall tolerate such behavior. Many lives are in danger when left on hands of addicted nurses. An impaired nurse is a real threat to patients no matter what their argument may be. Always bear in mind the alarming red flags of an addicted RN. Also, one must know the policies in the workplace relating to any substance abuse by an employee. Also know the policy of the Board of Nursing with regards to these impaired nurses. The next step is to document all the supporting details. If you become suspicious on your co-worker, you must be gathered all evidences and discuss matter with the higher authorities. A small pep-talk with a co-worker may also help, especially if that nurse is close to you. Hospitals on the other hand, must impose stricter rules regarding these impaired nurses. Zero tolerance policy – Pre-employment drug screening and education campaign might veer a nurse from substance abuse. Hospitals must make sure caught nurses will lose their jobs and be reported to the proper authorities for sanctions and penalties. Support group – Support groups for impaired nurses may help them overcome every burden they carry. There are various reasons for a nurse to divert to drugs. Many are underpaid, overworked and stressed on how heavy their loads are and for them and sometimes, all they need are small pep talks in order to be back on the right track again. Proper healthcare for those who get caught – Hospitals are advised to offer proper treatments to follow-up with their nurses once get caught. They shall be out of their posts but their health and safety should not be ignored also. Drugs do not choose the people who use them. Addiction knows no race, work or status in life. This is a sad reality for many as this is their only outlet to cope up with many hardships in life. Being a nurse is one challenge to face. However, this does not give us the right to abuse the medications which are supposed to treat our patients and save their lives. As nurses, we must be the one to protect them and not to be a threat to them.